Nowadays if you did something “Bitchen” like catch a huge fish well, most would take a digital photo, upload it on the internet and sent it to all their friends, and of course have bragging rights for the next zillion years. 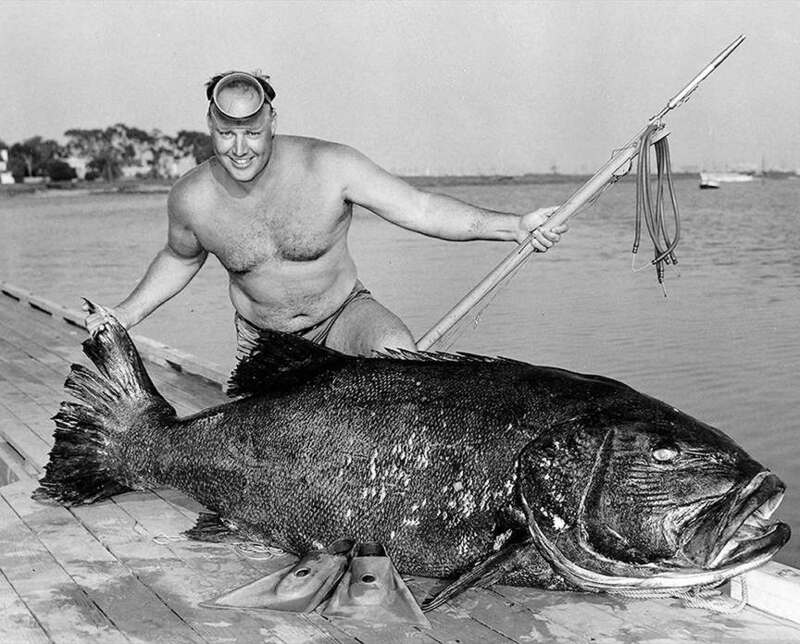 But, what if that fish was a huge 628lb Black Sea Bass – and back in the 1960s things were different, like, legal to catch Black Sea Bass, no internet, computers etc. And of course, getting photos developed took about a week and there were only a couple of places to do this. So, if you were fishermen, Donnie Tomlinson, and spend over an hour hand-pulling his nets in, and discovered this monster of a Black Sea Bass off of La Jolla Cove in your net, what do you do when you are in a 16′ wooden skiff? In Donnie’s case, he almost had to semi-sink his skiff to manhandle the fish into it. Then it was a very slow 3-5 knot cruise to Mission Bay where he almost sunk his boat several times as waves crashed over the rails because the skiff was riding very low in the water due to the weight. Now, the next question, “How in this @#$% beast of a fish out?” Even for Donnie (who was a very strong and big person) that’s a lot of dead weight to lift! Hummm … Donnie’s had a brilliant idea, he called a local towing company. With that said, they hooked the fish up and proceeded to cruise Pacific Beach, La Jolla and WindanSea claiming bragging rights to this Black Sea Bass. It is believed, this is the largest Black Sea Bass ever caught off the California Coast. Meda Editors Note: The Black Sea Bass NOW is a protected species and even back then one of this size was VERY rare. Fishermen are required by law nowadays to release them. However, back in August, 2009, a diver from the Scripps Institution of Oceanography in La Jolla spotted a 125-pound black sea bass floating on the ocean’s surface near Scripps Pier. Researchers recovered the fish and found a hook and fishing line attached to its mouth. They believe an angler accidentally caught the sea bass and released it, and that the trauma killed it. State officials allowed Scripps to keep the sea bass for its collection of marine vertebrates. A Scripps spokesman said acquisition of a local black sea bass is rare and offers scientists an opportunity to learn more about this once-plentiful resident of the La Jolla kelp forest. Yes there is no shortage of Blacks. I have fished them for 40 years. I have released them alive for 20 years since the closure. They just added another 20 years. Here is my complaint. Commerical net boats are allowed one per day interdental catch. Thats 365 fish per year per gill net boat. What happens when the net has 10 fish gilled ? Like a lot of fishery rules commerical rules are unfair to sport fishermen. At any rate we will never be able to harvest fish equally to the market industry. My biggest fish is 750 pounds measured weight. 1980. This is an up date for the rebound of giant black sea bass in southern Calif coastal water. From 2011 and until now, I have seen increasing numbers of giant black sea bass (GBSB) accidentally being hooked by shark fishermen, and released. From just one pier, the Oceanside long pier (1941′) at its deep end of 30′ depth. In 2010 we started to hook up some 3′-5′ fish with estimated weight of 100-200 lb. The number and sizes of fish hooked have been increasing sharply. In 2016 alone, I hooked more than 5 fish, other pier fishermen have more hook ups. The largest fish was a 8 footer with estimated weight of at least 450 lb, it looked like a cow. These GBSB will make fast straight run to the deep after being hooked, you can not stop it until it’s tired. thus many times it was brought in exhausted with white belly up (due to inflated bladder), but they usually be able to turn back down after about 10 minutes of rest. We either cut line, or remove the hook if the water is not too cold to get in. The hooks we used are mostly nickle plated carbon steel which will rust away in less than two weeks then fall off. We are doing the best we can to support the conservation efforts, but in Mexico water one fish per man/ day still is allowed to keep, and the GBSB can be imported to the US as legal catch. The states need to ban the selling of these imported legal catch GBSB. I can only imagine what it would be like to catch such a monster. I caught a 10 lb large mouth bass and thought i was having a heart attack. Lol. I was aboard a party fishing boat out of Port Hueneme about 1965 when one of the men on board caught a 465 lb black sea bass. We were fishing off the Channel Islands. I believe we were just off Anacapa Island. My grandfather, Bob Bourret, caught a 422 lb. black sea bass on 9-25-1960 near Balboa, CA. Boats name was “Merrie Sea” and the captain was Harold Woods. Andy: My dad was renting a garage behind the gas station run by Joe’s father, August Arve. I was there the night Joe came in with his 514 pound fish in the bed of his pickup truck. He said that he was “A pound under the world record and if he had dropped a couple of sinkers down its gullet he would have been in the record book”. San Diego Bottom Scrathchers Club. My fahter work with Wally at International Harvester which is now Solar Turbines on Pacific Highway. He was pictured in the late fifties in Sports Illustrated for catching a huge Sea Bass from a surf board free diving off the Coronado Islands. Website has some good history of these early waterman spear fishing some really big fish. Does anyone remember what year this was. Trying to think who the little boy might be. Maybe Brian or Tim? My father Charlie Frost speared a 405lb. black seabass on May 7 l959. This fish was taken off the south Coronado Island. My father speared another fish free diving off Guaymas Mexico that weighed 423lbs. This species was classified as Pacific Jewfish. My father was a member of the Kelpkings for many years. Just to be clear, hauling a fish to the surface often kills it anyway due to swim bladder overexpansion and decompression. You might as well save the weight, line and hook. Instead, take the money you saved and try investing it in fishermens’ education. I am looking for Skip Price who visited New Zealand in the 1970’s and stayed with Ace Welsh. If you are this “skip” or have any information about him please reply. To Skip Price: How big was that Black Sea Bass you speared off the Casa Pool and what year was it? Maybe around 1963? I still remember you next to it in the back of a pickup truck I believe. I believe the BSB in the pickup bed photo* was one from the South kelp at Los Coronados. I don’t remember the exact weight but seem to recall it was in the 350 lb. range. Never did weigh the fish I speared off Casa Pool. That was a big’un too. Two of us had to nearly sink the boat to get that guy pulled aboard dead. The poor old white seabass I speared on the same trip didn’t get much press as it was only 57 lbs. Them was the days, you should see it out there now….. nothing much around any more except pelagics in season. caught up and down the coast. They are protected and there are a couple of different ways to release them. The bass have an air bladder and when they are brought up from the bottom they inflate and can’t get back down without help. The best method is to use a weight of around 20lbs and attach a hand line to it. Then a small hook attached to 6lb test on a separate line. The hook is hooked into the lip of the fish and all is sent down. When the line on the 6lb is pulled it breaks away and the fish is good to go. The juvenile bass are really very colorful with purple and golden brown spots. Back in the day there were free divers who went out off the Casa and La Jolla Cove and really came in with some big fish on inner tubes. There was a diver I believe his name was Leroy who went to the Cove every morning at sunrise and blow a conch shell horn before going diving. 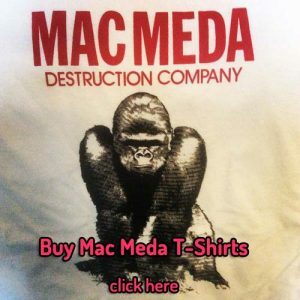 It was a long time ago…. I’m proud to say Donny was a friend of mine. Jon Sarrett: Commercial Lobster Fisherman, La Jolla, 1968. Back in the 1950’s there was a free-diver who speared somewhere around a 400 lb. plus or minus balck sea bass and brought it in around the La Jolla Cove. I’ve seen the picture several times over the years. He was just in trunks, face mask, fins and had a spear gun. Rumor was that he chased it around in the kelp to get a shot at it. He might have been a well-known local La Jollan or some extraordinary waterman, but I was just a kid and I don’t remember the specific details. The fish and the diver were apporximately the same length. The photo was probably in the local papers, the Union and the LJ Light.